Welcome to the Cooley Lab! ...a plant genetics lab at Whitman College, with interests in the molecular and evolutionary origins of biological diversity. Many plant and animal species have evolved unique or interesting patterns of pigmentation. I use the pigment biosynthesis pathway as a tool for studying the mechanisms underlying evolutionary change. My focus is on floral diversification in a group of South American wildflowers in the "monkeyflower" genus Mimulus. 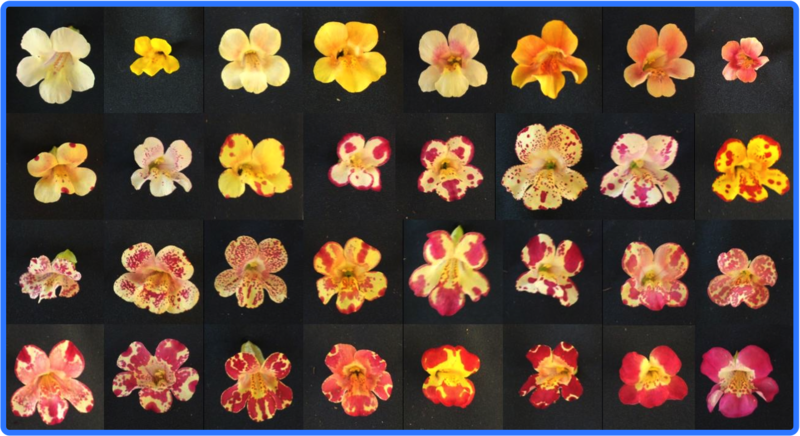 The flowers shown above are F2 hybrids of M. l. variegatus, which has large solid patches of red anthocyanin pigments on a background of white petals, and M. cupreus, which has a speckling of red pigment overlaid on a background of yellow carotenoid-pigmented petals. In the F2s you can see the parental color and patterning traits recombined in different ways.